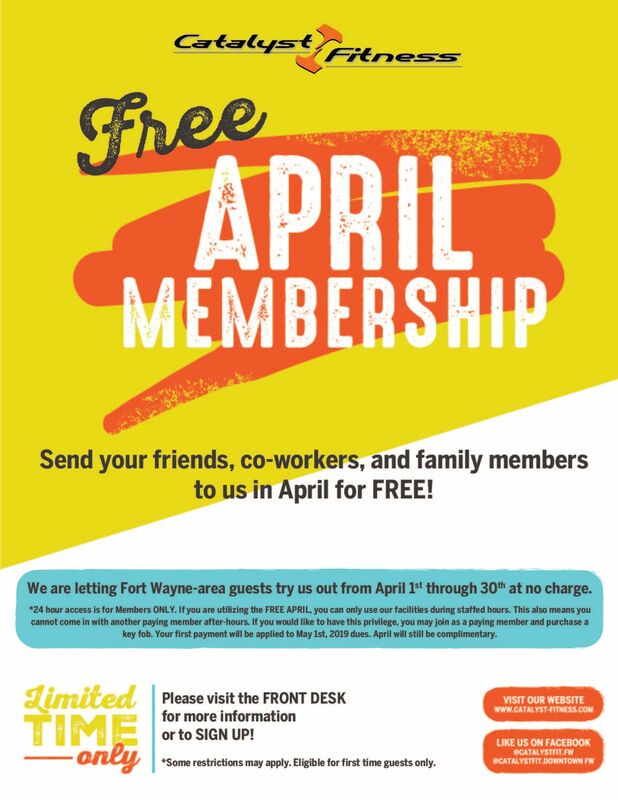 Join us for this incredible opportunity to try any of our facilities as a member for the entire month of April at no charge! Yes, you heard that right. We understand that committing to a healthy lifestyle can sometimes be challenging... and we want to make it as easy as possible for you to have an opportunity to do that. Just register at the link below or stop in to one of our facilities to get signed up. You will have the entire month of April to come in and get started on a workout program. After hour's access is NOT included. If you wish to have full 24 hour access, you must join as a paid member. If you choose to do so, we will apply your first payment to May so you will still have April for free. Don't pass up this chance! We are conducting our first ever referral contest and giving out some incredible prizes! Here's the bottom line... referrals from our happy members are the lifeblood of our business. As a locally owned and operated business, we simply cannot survive without your help in bringing new members to us. So we are challenging YOU to send us as many new members as you can between April 18th and June 18th and are giving out prizes (including cash) for those who are the top referrers! Do you have what is takes to win the top prize of $500 cash?! - The contest runs from April 18th to June 18th. This means that anyone you refer must sign up as a paying member during that time frame. - They must tell us that you referred them at the time that they are signing up. Not afterwards. This is important so make sure they know! For example... if they come back the next day and tell us, it won't count as a referral for you. No exceptions. 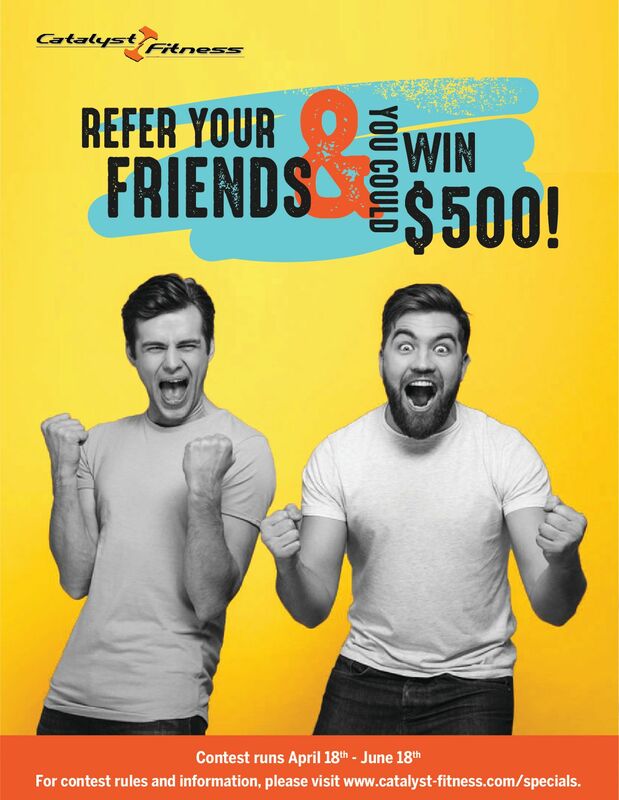 - You will be contacted afterwards by one of our wonderful staff members and given the option to get a free month for the referral (which is our normal gift to our members for referrals)... or you may instead choose to get a point towards the referral contest. Once you choose, your choice is locked in for that referral and cannot be changed. - You must be a current, paying member in good standing to be eligible for the contest and to receive points or prizes. - People you refer must still be members in good standing as of the end of June 18th, 2019 for them to be counted in the final total. - Online membership sign-ups count (so share and share often), but they still must provide your name as the person who referred them when they come in to the gym to finish registration... OR they may also email customerservice@catalyst-fitness.com to tell us about the referral. They must email us on the same day that they sign up. We recommend that they do both just to be sure! - The individual with the most referrals (5 or more) will win the $500 cash. - We will also have 3 awesome runner-up prizes for the people with the next 3 highest point totals (also must be 5 or more). Those prizes will be announced soon. - Take advantage of the FREE APRIL offer to help get them in the door! Just remember they still must sign-up as a paying member before the end of the contest for it to count. - It is sometimes a scary step to take to join a gym. Offer to help your friends get started! Plan to meet up at a regular time so they are not alone. Not only do we want them to join... we want them to succeed! - Let them know about all of the great perks they can get as members including free classes, tanning, and child watch. - And remember to share with your friends about your experience and how good it has been for you!